Reoccurring Rose Garden consists of a body of recent work by Rigg that collectively navigate the psychogeographical terrain of memory, place and object. 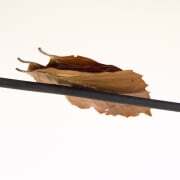 Song consists of a stack of 3 preserved leaves stacked on top of each other, balancing improbably upon a black telephone cable that cuts a line through the full length of the gallery space. Occasionally they fall, disturbed by movement in the air, left until carefully repositioned by the gallery attendant. The list of materials for the piece: ‘leaves, cable, diaphragm-pump’ disclose the means, and shift the work away from the illusory towards a pragmatic, sculptural attempt to recreate an imagined or half-remembered occurrence or vision. This near futile attempt by Rigg to physically manifest the ambiguities of a semicognitive interiority alludes outwardly to the poetic, through a paradoxically reductionist sculptural strategy. Related conceptually to an earlier work ‘I forgot what was said when we were outside, stood empty, now without those words I fell back’ (2010) comprised of 2 full sized telegraph poles with a small cable between them, Song is part of a family of works that relate to a half forgotten conversation between the artist and a significant other. Shown here in Workplace London, the particularities of the gallery space and its dislocating effect (being located in the ½ floor of a corporate building with no natural light) combine with the effect of being, unusually, at the same level of a normally very high telegraph wire to further disorientate the viewer. Alongside Song, Rigg presents 3 works on paper. Selected from an on-going series of drawings for extant or future artworks, these pieces can be considered as extractions from a mapping of thought, of workingsout. 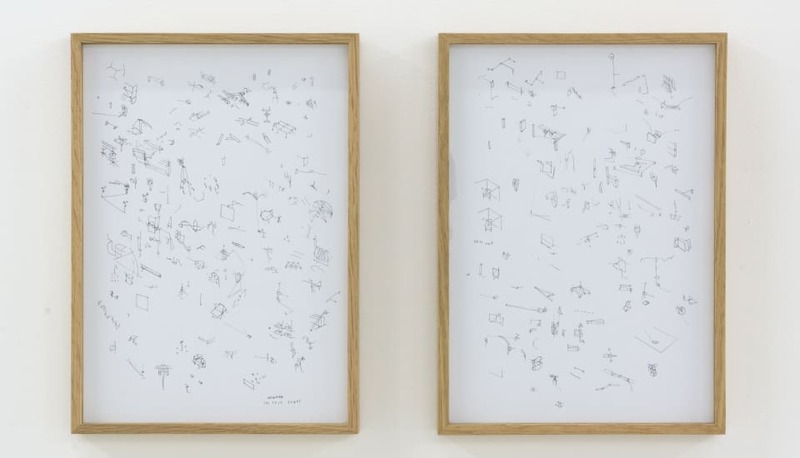 Comprised of repetitious isolated objects in flattened or isometric perspective, alongside various notes and numerical equations these drawings can be seen as indexical and diagrammatic renderings of thoughts and ‘workings – out’, that are often interrupted by ‘ordinary’ life such as ‘to-do’s’ or a scribbled phone number that shares its space with a numerical equation or poetic statement. Relating materially to the 3 balanced leaves, these drawings reinforce a structural repetition that echoes throughout Rigg’s practice. The title of the exhibition Reoccurring Rose Garden alludes to a yet to be realised piece that draws its inference from the pattern found in a commonplace floral carpet. Implying both the idyllic and the suggestion through the ‘reoccurrence’ of the incomplete or the unresolved; Rigg’s work purposefully addresses a problematic uncertainty and paradox that lies near the root of human intangible thought and our relationship to reality.